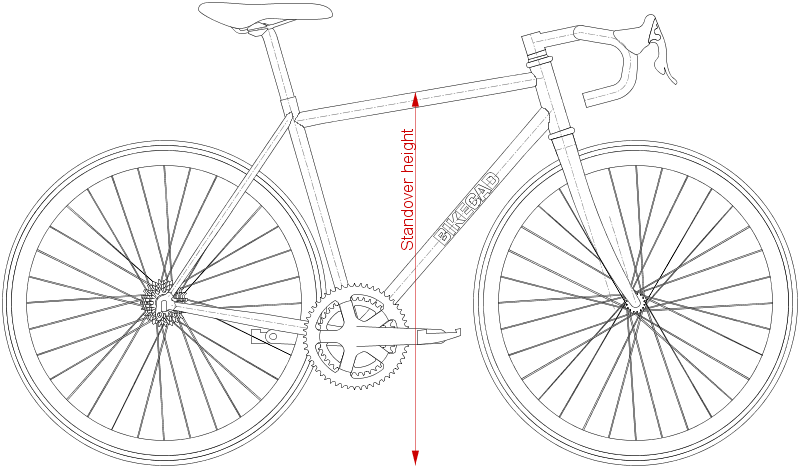 Standover height with sloping top tube ? is this the height from the center of the top tube ? Dunno, but what difference does it make? It is a worthless characteristic on a sloping top tube bike. Standover height should be the actual usable standover height. Anything else would be really useless. Thanks for the comments guys. I think useful stand over height, what ever that is, zeros in on the answer. I assume this is in the middle of the top tube to the pavement. The reason I am asking is that I am not as flexible as I once was, I am 72 and it is more difficult to mount a level top tube bike. I am thinking that with a sloping top tube it would be easier to swing my leg over. It's also easier if you lean the bike. It's not the sloping top tube that is the issue, it's the height of the seat. Yeah, it's usually the height from the floor measured half way between the head tube and the seat tube. And you're exactly the kind of rider it's intended to be useful for. All true, BUT it is almost impossible for a sloping top tube bike that is the RIGHT SIZE to not have sufficient stand-over height. Hence my comment about what difference does itmake. My experience says standover in specs means nothing. Even two bikes from the same company, one that has higher standover (in specs) that another in reality has more space under the groin. So after finding those sloping tubes you need to try yourself. The models I found so far to be best in this department (I have short legs) are Giant TCR and Trek Emonda. FSA self-extracting crank bolt seized?